The legal side of blogging that every blogger should know about! Hellooo so for today I thought I would do something a little different – My new blogging chum Jane from plainjanelifestyle.com and I have decided to guest post on each other’s blogs! I hope you enjoy this post and apologises in advance to the non-US readers this post is specific to US legalities of blogging. I hope at some point to do a post on UK legalities as well as things are changing soon. Jane Boughton with http://www.plainjanelifestyle.com Jane is a freelance writer and blogger who enjoys creating content about food, travel and blogging. She resides in the pacific northwest city of Portland, Oregon, USA. The world of blogging is complex. I think we can all agree on that. Disclosure: This page contains some affiliate links . Please know that I may receive a percentage or commission from a link included on this page, at no cost to you. I will only recommend a product or service that I have used or believe has substantial value to my readers. Or, perhaps you are a seasoned blogger and you know the basics to blogging legally already. Either way, new blogger or seasoned pro, adhering to the law while you blog is a must and it’ s still important to stay on top of changes with the law as it applies to the blog-o-sphere. You need to claim income earned through blogging if the minimum amount within a calendar year is $400 or more? That’s right. You need to pay taxes on that income earned, just like you would pay taxes at any other job you have had. So…where does one even know where to begin with all this legal stuff? Well, for this matter, I turn to the experts. First up is Jackie. Jackie is a practicing Attorney from Pittsburgh, PA and owner of the website www.Jadeoak.com. She has been blogging for over 5 years and has been a licensed attorney in Pennsylvania for nearly 8 years. She was kind enough to take time out of her very busy schedule to answer some questions about the legal side of blogging. If you could only recommend one piece of legal advice to a blogger or business. What would you recommend that they incorporate into their website and why? In your experience, what are some of the legal pitfalls that bloggers are overlooking the most and why does it matter? One of the biggest things I see is people not properly disclosing sponsored content, including any sort of collaboration with brands or companies. If you have affiliate links, got paid to write a blog post, received freebies in exchange for a blog post or are posting any of these types of content on social media, you need to properly disclose it. In the US, the Federal Trade Commission wants it to be very clear to potential consumers whenever there is a vested or financial relationship between a blogger and a brand. What are some of the biggest implications one could face if they fail to consider making sure their blog is legal? A major issue with blogs centers around copyright issues. With things being very easy to steal on the internet, bloggers need to have the right statements in place to help avoid possible would-be thieves from taking their content. On the other side of the coin, bloggers need to be careful to only use content where they have the proper permission, a big thing being the use of photos and images online. Bloggers need to be sure that they the right permission before reusing or reposting images online even if they are coming from stock photo sites. How much do laws change each year and where can bloggers go to make sure that they stay up to date? Many of the laws related to blogging are related to more general business laws and best practices. Laws can always change and the best practices in order to stay current can change. Bloggers should follow trusted sources such as business publications or other bloggers who write about these topics. As an attorney I stay up to date with changes in the law and bloggers can subscribe to my email list in order to be kept updated. Is there something that I didn’t ask that you think is really important for businesses and bloggers to know? The legal side can be overwhelming, but I think it’s important to note that many of the legal aspects of blogging can be established once and only revisited if/when circumstances change. Many of the legal statements or contracts that a blogger would need can be used for years once they are set up properly. Michela is a law graduate turned graphic design and digital marketing guru. She wrote a great piece on legal email marketing that every blogger should read. Check it out here. I love how Michela’s writing is straightforward and extremely easy to comprehend. As mentioned early on in this post, staying on top of ever changing laws as it adheres to blogging is crucial. Claiming that you did not know the law is not an excuse for not abiding by the law. One helpful place to check periodically is the Federal Trade Commission’s (FTC) page (here) regarding rules for online marketing, advertising and endorsements. The FTC requires all blogs to include a disclosure statement if you are writing about a product or service that you received for free or that you were paid to write about, such as a sponsored post. Additionally, if you are an affiliate for a company and you receive compensation for writing about that company, you need to disclose that. A disclosure statement needs to be written clearly and concisely and not hidden. Most bloggers choose to do this at the beginning of their post or at the bottom of the post. But just remember if you choose the bottom of your post, just make sure it still shows up on the same page. A disclosure statement does not count if it falls on page 2 of a blog and on page 1. Bottom line, If you are monetizing your blog, and you accept a form of payment in exchange for promoting a product or business, you will want to refer to the FTC guidelines to make sure you are compliant and will need to be clear about your disclosure. Being a professional blogger is a fairly new profession. Whether you do this on the side while you continue to work a fulltime job or blogging is your full time job, you will need to pay taxes. One of the biggest differences with paying taxes as a self-employed small business blogger is that you need to pay your taxes every quarter and not yearly. The IRS has due dates of January 15th, April 15th, June 15th and September 15th. For additional IRS guidelines check their website here: IRS. You are able to claim deductions as a small business blogger, which is pretty cool. You can deduct costs associated with the upkeep of your blog such as website hosting fees, like bluehost or Siteground. (Affiliate). As well as blog website templates, design, and maintenance that you might purchase through your blogging platform such as WordPress (Affiliate). For a comprehensive and through guide to understanding all items you can claim on a tax deduction please refer to the IRS website here. Even if the only thing you are gathering is emails for your blog’s newsletter, this counts. You need to state to your readers what your intention is with their email information after it is given to you. It is recommended that you include the privacy statement in the footer of the email newsletter as well as having it on your website. Although it is not required by law that your website contain a Terms & Conditions statement, it is a good idea. By stating to your readers who owns the intellectual property on your blog and how readers can or cannot use that content is important. Your content could include photos, templates, eBooks and articles. Basically anything on your website! The terms and conditions statement is where you would list your copyright information. Like Terms & Conditions, a Disclaimer is not a mandatory legal statement that is required to be on a blog. It’s a good idea to place a disclaimer if you are writing about diet plans, legal issues, financial or medical topics. That’s because you don’t want to be liable if someone takes your blog post as expert advice. Most bloggers will put their disclaimer statements at the end of their post. It can be simple and just a few sentences will suffice. A copyright is not something your website must have by law, but it is another way to protect your hard work. By U.S. copyright law you own everything that you uniquely create. This includes your photographs, blog posts, eBooks, you get the idea. A copyright is very easy to put in place. Every time you publish a post at the end you should include your copyright notice. The notice needs to contain the © symbol, the year the content was published an your name or company name. If you do not want someone to copy your content you need to add the statement “All Rights Reserved” or “no reproduction without permission”. It is not law to register your content with the U.S. Copyright office, but it is advisable. If you were ever in a situation where you were bringing on a law suit, your content must be registered. When selecting images to use on your website remember that you can’t just copy a photo from someone else’s website and use it as your own if you haven’t gotten permission to use the photo from the owner. The owner of that photo may gave you permission, and may even ask for compensation in exchange for you to use that image. I think it is always best practice to use your own images. But there are so many wonderful stock photo options online where you can get images for free or pay a nominal fee. Disclaimer: This post is intended for informational purposes only, and is not intended to provide, and should not be relied on for tax, legal or accounting advice. You should consult your own tax, legal and accounting professional before engaging in any transaction. Thanks to Jane again at plainjanelifestyle.com for her post – please feel free to leave comments. 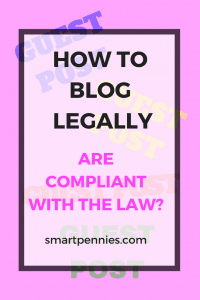 Please feel free to SHARE this post with anyone needing help with the legalities of blogging!